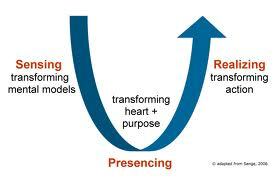 (1) The leadership process requires three movements: (1) establishing the horizontal connection (“observe, observe, observe”), (2) establishing the vertical connection (“connecting to Source”), and (3) acting from what emerges in the Now (“acting in an instant”). These are the practices of the transformational leader, the leaders that we need to be if we are to take the next evolutionary leap. There is something deceptively simple about the way this proposition is stated, naming three movements is very different from being able to move in these ways. It takes disciplined practice to make each of these moves – how does one “observe, observe, observe” amidst the constant rush of today’s organizational life? How does a leader even consider making a connection to source in the context of her work? And how does one act in the now in this world of the strategic plan? Thankfully, there are long-established practices for developing these capacities. Scharmer is essentially describing the characteristics of awakened human beings, humanity shares in the inheritance of their findings. Our challenge is found in the need to develop the collective practices to develop a shared capacity to observe, observe, observe, connect to source and act from the now. Many of us are doing work to experiment with and to define the social technologies, organizational arrangements and practices that will sustain this level of leadership. What have you seen that works? What is emergent in your world? One thing that works is linking observation with affirmation. When we recognize one another’s contribution, that tends to breed deeper confidence, investment and involvement. It’s like what Brenda Euland said about listening–when someone laughs at our jokes, we become funnier. When we encourage one another, we create pathways to deeper authenticity and deeper capacity to see and do and break through.